Tremendous advances have been made in joint replacement surgery, making it a viable option for a greater number of people than ever before. Dr. Janke, Dr. Naide and Dr. Malloy utilize computer-assisted technology to perform total knee replacement surgery. 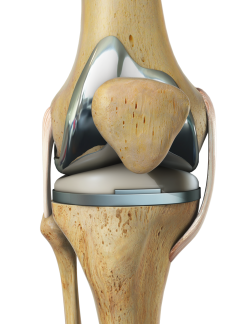 This advanced technique enhances results and recovery of a total knee replacement by providing more accurate placement and alignment of implants. If you’re reading this section, chances are you (or a loved one) are considering or preparing for joint replacement surgery. You’ve likely tried several non-surgical therapies, including anti-inflammatory medication, injections into your joint and physical therapy. Still, pain and limited movement may hold you back from doing the things you used to do without worry. And now there’s even better news. During a joint replacement procedure, your surgeon will strive to ensure that everything is aligned properly. Accurate alignment of the hip or knee components is critical to the overall function of your new joint,1,2 and it also plays a role in helping your joint feel healthy again, and helping the joint replacement to potentially last longer. *National Institutes of Health Consensus Development Conference Statement: Total Knee Replacement, 12/10/03. Sikorski JM, Chauhan S. Computer-Assisted Orthopaedic Surgery: Do we need CAOS? J Bone Joint Surg 2003; 85- B:319-23. Noble PC, Sugano N, Johnston JD, Thompson MT, Conditt MA, Engh CA Sr, Mathis KB. Computer Simulation: How can it help the surgeon optimize implant position? CORR. 2003 Dec; (417):242-52.